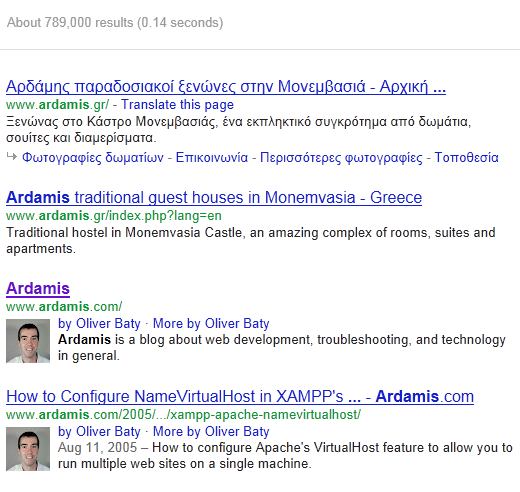 For years, ardamis.com has had a Google rankings nemesis in ardamis.gr. For much of the time that I’ve spent watching the results for the search phrase ‘ardamis’, ardamis.com has consistently ranked #1, and ardamis.gr typically landed in second or third place. But at some point in 2011, and my recollection is that this was occurring pre-Panda, ardamis.gr moved to the top spot and has stayed there since. I can’t really explain why a post from 2005 on configuring a setting in Apache would be the second best page on the site, but I guess I’ll take it. My properties do pretty well, for what isn’t a highly competitive phrase. Items related either to ardamis.com or me personally appear in positions 3, 4, 5, 7, 9, 10. I’ve done some comparing of these two domains, and I am still unsure why Google is currently favoring ardamis.gr. I felt pretty confident that geography and Google’s focus on local search would mean that North American users would be returned results that favored ardamis.com, so long as they were not obviously searching for travel information about Greece. But this isn’t proving to be a safe assumption. Even more strange is that it’s the Greek language version of the page that Google is ranking first, even before the English language version. This promotion of a foreign-language page is very odd. Google Toolbar Page Rank (I know, I know, but it’s one of many metrics I’ll use) shows ardamis.com getting a 5 and ardamis.gr getting a 3. I won’t make too much of this, but I wanted to point out that the toolbar PR is not equal. I ran the list of URLs on the first page of Google through the Open Site Explorer to get a better sense of how strong the pages and domains were, and ardamis.com comes out on top. The pages on ardamis.com all contain verified authorship markup linking them to my Google Plus profile, and I get my profile picture next to my pages in the results. I don’t detect any author markup on ardamis.gr. The pages on ardamis.com contain structured markup (HTML5 microdata as described at schema.org and hCard microformat). The Rich Snippets Testing Tool returns no warnings for ardamis.com. Rich snippets from the pages at ardamis.com are displayed as part of the page data in Google’s results. The page at ardamis.gr does not contain authorship or rich snippet markup. In July of 2009, ardamis.com had a Toolbar Page Rank of 6 and 3 one-line sitelinks, before later disappearing. Then, in October of 2010, the sitelinks returned for awhile before disppearing again. I last noticed the sitelinks in January of 2011. I’ve developed and released a WordPress theme and a few Plogger themes, and put links back to ardamis.com and the theme’s post in the footer. These links have helped the home page gain nearly 2 million inbound links, with the Apricot WordPress theme’s page gaining nearly 1.5 million and the most popular Plogger theme’s page gaining just over 70,000. That’s a lot of links. Google’s Page Speed Online tool awards ardamis.com a Page Speed Score of 96 (out of 100), while ardamis.gr gets a score of 68 (out of 100). I have put quite a bit of effort into optimizing the performance, and I’m pretty happy with a 96. Post-Panda, I combed through ardamis.com and weeded out the posts that I was unsure about. At this point, I wonder if ardamis.com is suffering a penalty somewhere. Maybe all of those footer links are actually hurting the site. Or maybe the combination of a country code top-level domain and a real geographic location is just incredibly powerful when compared to a random word attached to a .com domain. This entry was posted in Google, Nonsense, Web Site Dev and tagged Google on 5 May 2012 by Oliver Baty. It might have something to do with comments… Google has an auto-filtering system that they use to sort of discount the results from what they refer to as “comment spamming” — It is controversial and is known to hurt legitimate sites. This might have nothing to do with it at all, I’m basically at a loss for words. That’s all I can come up with and even with that I’m still reaching. I definitely would contact Google and tell them that you’re not complaining or anything, it’s just that as a webmaster you’re trying to understand what factors allowed this to happen so that you can work to improve your site’s appearance on Google’s search results..